Natural alexandrite is a very rare gemstone having been first discovered by Finnish mineralogist Nils Gustaf Nordenskiold . It was named alexandrite in honour of the future tsar Alexander II of russia. Nils initial discovery occurred as a result of an examination of a newly found mineral sample , which he identified as emerald at first. Although alexandrite is a relatively young gemstone, it certainly has a noble history. The alexandrite variety displays a color change (alexandrite effect) dependent upon the nature of ambient lighting. Since it shows both red and green, the principal colours of old Imperial Russia, it inevitably became the national stone of tsarist Russia. Beautiful alexandrite in top quality, however, is very rare indeed and hardly ever used in modern jewellery. In antique Russian jewellery you may come across it with a little luck, since Russian master jewellers loved this stone. The most astonishing and spectacular quality about this stone is its sensational ability to change its colour. 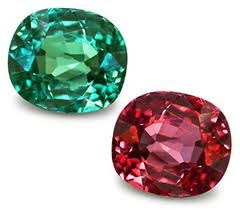 Green or bluish-green in daylight, alexandrite turns a soft shade of red, purplish-red or raspberry red in incandescent light. This unique and unusual optical characteristic makes it one of the most valuable gemstones of all, especially in good qualities. 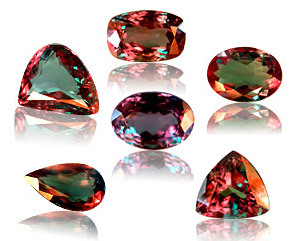 Due to its chemical composition , alexandrite is very scarce. It basically belongs to the chrysoberyl group, which also includes cymophane ( cat's eye ), with chromium playing a major part and also responsible for the colour change associated with alexandrite. Like many other gemstones, natural alexandrite emerged millions of years ago in a metamorphic environment. But unlike many others, its formation required specific geological conditions. The chemical elements beryllium (a major constituent in chrysoberyl) and chromium (the colouring agent in alexandrite) have different chemical characteristics and do not as a rule occur together, usually being found in contrasting rock types. Not only has Nature brought these contrasting rock types into contact with each other, but a lack of the chemical element silica (the second most common element in the Earth's crust) is also required to prevent the growth of emerald. This geological scenario has occurred only rarely in the Earth's history and, as a result, alexandrite crystals are very scarce indeed. Natural Alexandrite up to 5 carats and larger were traditionally thought to be found only in the Russian Ural Mountains. But since the 1980s when alexandrite was discovered in Brazil, the situation has changed. The Brazilian alexandrites have showed both a distinctive colour change and good clarity and colour. Though the colour is not as strong a green as the original one, the colour change is clearly visible. 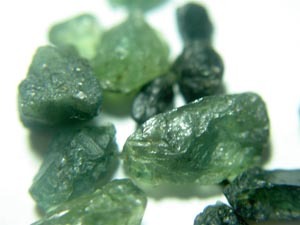 Nowadays alexandrites are also obtained from sources in India, Srilanka, Burma, Zimbabwe and some parts of Tanzania. A natural alexandrite is supposed to be a stone which brings good luck. With a hardness of 8.5, alexandrite is a great stone to wear. The more distinct the change of colour, the more valuable the stone. 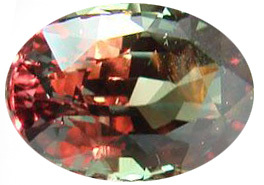 A fine alexandrite should show a vivid bluish-green in daylight and a purplish-red in artificial light, without any trace of undesirable brown or grey. If the origin of the stone is known beyond dispute to be Russia, we are talking about a real rarity of enormous value. Finely faceted alexandrites above one carat are thus among the most expensive gemstones in the world, rarer than fine ruby, sapphire or emerald. Some gemstones described as lab-grown (synthetic) alexandrite are actually corundum laced with trace elements or color-change spinel and are not actually chrysoberyl. As a result, they would be more accurately described as simulated alexandrite rather than synthetic but are often called Czochralski alexandrite after the process that grows the crystals. Alexandrite is a stone for gemstone lovers, experts and enthusiasts, a truly understanted gemstone. Its uniqueness and high value are not evident at first sight. The mysterious colour change will only occur on exposure to different light sources. But if you really get involved in alexandrite, you will be utterly fascinated and involved by this gem. Maybe you will also feel some of the magic and love associated to it. It is considered a good luck gemstone. It also has a reputation for assisting creativity and imagination.